Periodontics is the branch of dentistry that focuses on studying the supporting structures of teeth, primarily the gums. To better protect the long-standing health of your smile, Mark L. Davis, DDS, and his team at Chowchilla Dental diagnose and treat the diseases and conditions that damage the integrity of the surrounding structures that support your teeth. With professional prevention and treatment of gum disease, a functional, healthy smile can be achieved once more! Call us today to schedule a consultation! Gum disease is an oral infection of the periodontal (gum) tissues that are responsible for holding teeth in proper place. Although there are both helpful and harmful bacteria always present in the mouth, disease-causing bacteria becomes prominent and leads to gum infection when there is a lack of consistent oral hygiene. Plaque, the sticky, white film of bacteria, builds upon the surfaces of teeth and begins to harden, forming tartar (calculus). What Are the First Symptoms of Gum Disease? If you or a loved one are experiencing any of the above symptoms, it’s essential that you contact Dr. Davis and our team at Chowchilla Dental today. Catching gum disease in its earliest stages significantly increases your chances at preserving healthy teeth and achieving long-lasting oral health once more! What Are the Stages of Periodontal Disease? Gum disease progresses in three different stages: gingivitis, periodontitis, and advanced periodontitis. Each stage poses a threat to the overall health of your teeth, gums, and other surrounding structures of your smile. Gingivitis- is the earliest and most easily treatable phase of gum disease. Plaque buildup causes gums to become irritated and inflamed due to toxins making their way along and below the gumline. Although symptoms can range from minor to almost unnoticeable, red, swollen gums that bleed during routine brushing and flossing are the initial warning signs of the condition. Periodontitis- develops when gingivitis is left to progress. The inner layer of gums begins to pull away from teeth, creating pockets. These tiny spaces between teeth and gums collect more plaque and other debris, which causes more gum irritation and infection. This, over time, results in gum tissue recession, deterioration, and weakening of the jawbone. Advanced Periodontitis- is the final and most destructive phase of gum disease. The fibers and bone supporting teeth are significantly damaged, which causes once healthy teeth to shift and loosen. Aggressive gum disease can affect your bite, as well as the health and function of teeth. If professional treatment can’t save them, teeth will most likely need to be removed. Protecting a healthy smile can be as easy as exercising prevention by implementing a healthier diet and lifestyle choices. 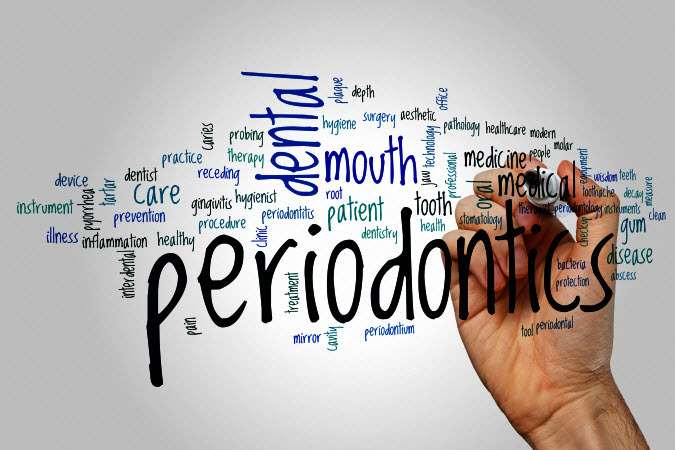 How Does Periodontal Disease Affect Your Overall Health? Aside from being the leading cause of tooth loss, gum infection can lead to serious overall health issues. Because your immune system is on the defense against the toxins found in disease-causing plaque, gum tissue is inflamed. Simple brushing and flossing can create an easy point of entry for bacteria and inflammation to travel through the bloodstream and accessing other areas throughout the body. Heart disease- As oral bacteria spreads, so does inflammation. This can easily irritate the arteries, causing them to constrict, thus making arterial plaque more difficult to pass through. Because of this, there is an increased risk of heart attack or stroke. Diabetes- If diabetes is already present you are at an increased risk for developing gum disease. Oral infection may make this health condition more difficult to manage as inflammation can disrupt blood sugar levels, even with the right amount of insulin. Prenatal Concerns- Because of the numerous hormonal changes during pregnancy, gum disease may also be connected to low birth weight or premature newborns. It is believed that the toxins found in harmful bacteria can reach the placenta through the mother’s bloodstream. This can greatly interfere with the healthy development of the fetus, potentially leading to induced labor. Because of these recent medical findings and so many others, gum disease, even in its earliest form, should never go ignored or untreated. What is the Best Treatment for Gum Disease? Treatment will depend on the level of periodontal infection present. Gum disease treatments are designed to address the fundamental causes of the disease and help re-build your health and wellness from there. Your best defense against developing gum disease is always prevention. To protect your gums and encourage a life-time of healthy supporting tissues, diligent oral hygiene in between dental visits is essential. Digital X-Rays and Imaging- for precise images of your teeth that your dentist uses to evaluate your overall oral health. These X-rays are used to capture images of the interior of your teeth and gums. This can help your dentist to identify problems, like detecting underlying gum disease. Detailed Examinations- for evaluating the current state and health of your teeth, gums, and other surrounding structures. Regular dental exams help protect your oral health and general well-being.Dental exams give your dentist the chance to provide tips on caring for your teeth and to detect any problems early — when they're most treatable. Thorough Dental Cleanings- for cleaning teeth, removing plaque and debris in the hard-to-reach areas that regular brushing and flossing cannot. This is essential for preventing against gum disease, which leads to early tooth loss. Professional dental cleanings also give your dentist or hygienist an opportunity to compare the state of your oral health to that of previous visits and steer you in the right direction towards proper oral hygiene. Patient Education- for helping patients understand the essential connection between oral health and overall well-being. Oral health education significantly helps patients develop healthy habits and attitudes about their dental health. Antibiotic treatment comes in several different types. Oral forms and topical gels are applied directly into the gum pockets to kill off existing infection. They can either be prescribed at a lower dose for a more extended period, or for a shorter term with a higher dosage to stop bacteria from developing. Antibiotics can be prescribed before, during, or after periodontal deep cleanings or surgery. Also known as periodontal deep cleanings, scaling and root planing is designed to effectively remove plaque, tartar, and treat pockets of infection formed beneath the gum line. After bacteria is cleaned away, rough areas of the tooth roots are smoothed out to enable the gums to reattach. Medications such as prescription mouthwashes or antibiotics may be needed to protect against further infection and encourage proper healing. Pocket irrigation is usually performed with scaling and root planing. The tartar and plaque below the gum line are removed with special scaling and root planing instruments. When the pockets are disinfected, antibacterial materials applied using an oral irrigator. This helps reduce oral bacteria that may still remain in the pockets. Pocket reduction procedures promote proper healing in gum tissues, encouraging them to reattach after scaling and root planing. During this procedure, the gum tissue is folded back to remove the disease-causing tartar before securing tissue back into place. This typically depends on the stage of gum disease present. If you have early gingivitis, symptoms may range from minor gum inflammation, to almost unnoticeable. With advanced periodontitis, however, painful chewing, gum recession, and loose teeth are just a few of the serious conditions of the disease. How can I treat gum disease at home? Brush your teeth twice a day or, after every meal or snack. While routine brushing and flossing are always recommended, if you have gum disease, you should make an appointment to see your dentist for proper treatment. How Can You Tell if You Have Bad Gums? If you have gingivitis, your gums will typically be red, swollen, and bleed easily. You may also experience bad breath that doesn’t go away. If you have periodontitis, your teeth will appear longer due to gum tissue recession. How Can I Make My Gums Healthy Again? In addition to seeking professional treatment with deep cleanings and possible antibiotics, you can improve gum health by simply brushing properly and flossing regularly after every meal. While receding gums don't grow back on their own, you can talk to your dentist about the number of treatments available to correct the issue and prevent gum recession from getting worse. Can Gum Disease be Cured? The only type of periodontal disease that can be cured is gingivitis. When detected early, it can be reversed by professional treatments paired with diligent oral hygiene in between visits. Does Gum Disease Go Away? Gum disease is an increasing health risk which will not go away by itself. Unlike common issues like a cold, that will clear up on their own, gum disease requires professional treatment. Depending on the level of gum infection, it may be reversed or may need routine periodontal maintenance to keep under control. Does Gum Disease Go Away When Teeth Are Removed? Unfortunately, no. Though it may be in the best interested of your long-term oral health to have damaged or loose teeth removed, gum disease is an infection of the gums. It requires special treatment to be treated properly. Can My Teeth be Saved if I Have Gum Disease? When gum disease detected early on and paired with deep cleanings and diligent oral hygiene, there is a good chance teeth can be saved. The sooner you’re proactive about getting proper gum disease treatment; the more likely natural teeth can be saved. Contact Us for Periodontics in Chowchilla! With gum disease treatment through periodontics at Chowchilla Dental, Dr. Mark L. Davis and his team can help you achieve a smile that looks and feels healthy once more. You deserve to experience long-lasting oral health. Call our dental office today!